In the Rider-Waite-Smith deck The Emperor is portrayed as an established and stern ruler holding a sceptre and firmly sitting on a throne adorned with four sculptures depicting the ram (i.e. Aries in Latin), set in a sulphurous red background. 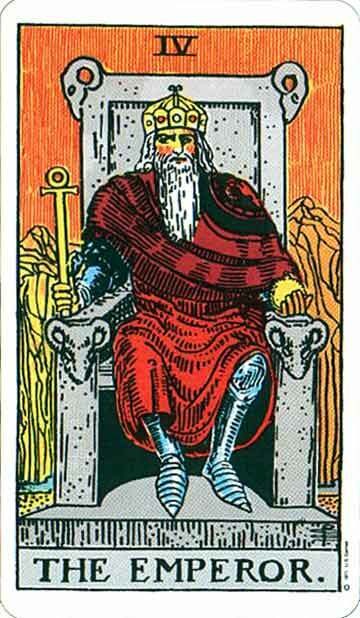 This tarot trump card is the fourth of the Major Arcana, traditionally assigned to the Hebrew letter Heh, (window) and the astrological sign of Aries. The Emperor holds the Egyptian cross, or ankh, as a sceptre, which in other decks is the globus cruciger, the symbol of authority of Christian Roman emperors and kings aimed at representing the dominion of their religion on the planet. In Robert Place’s Tarot of the Saints, the Emperor is interpreted by St Constantine holding the labarum, the emblem he dreamt of, while hearing the voice “In hoc signo vinces” (In this sign you will win), and that he then ordered to put on the shields of his soldiers so as to win the battle against the anti-Christian emperor Maxentius. As a result of this victory Christianity became the official religion of the Roman Empire. 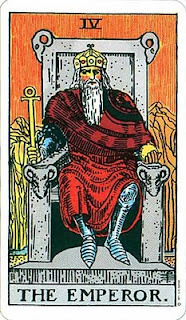 In the Aleister Crowley’s Thoth tarot deck the Emperor is portrayed with crossed legs, which is a characteristic this card shares only with another Major Arcana, the Hanged Man (associated with Neptune). In this as in all other decks the Emperor does not carry any weapon and the sign of his power is given only by a profound sacred authority, and not through the threat of arms. A detailed description on the Emperor’s authority appears in Meditations on the Tarot, one of the most profound studies on Western esotericism. The book, written by an anonymous author (identified as Valentin Tomberg), has attracted abundant praises in the Christian and Catholic environment and features even an afterword by Cardinal Hans Urs von Balthasar, one of the greatest Catholic theologians of the 20th century. For the Unknown Friend (the term the anonymous author uses to refer to himself) God, similarly to The Emperor, is powerful only when his authority, far from being imposed with force, is freely recognised and accepted. Spiritual practice is shown here as the way to awaken from our dormant consciousness and unveil the mystery of our true nature. The Major Arcana of the Tarot, similarly to the Gospels or the Cabbala, are spiritual exercises that need to be deeply practiced, rather than intellectually explored. The use of the Major Arcana as spiritual practice is not meant to provide knowledge of new elements, but allows acquisition of knowledge only when needed. This knowledge is stored in the deep reservoir of the Mighty Gap (see article above), until when the time comes it is acted out and becomes visible through Aries, The Emperor and the start of the new year cycle. Winter shelters the seed of knowledge, which eventually emerges with spring. In order to achieve true knowledge our mind, which is the apparent organ of knowledge, needs eventually to surrender to the heart, which is the organ of love, meant as complete knowledge. This act of surrender is implemented through spiritual practice, yet in a way, as the solid and pragmatic aspect of the Emperor exemplifies, that is fully rooted in reality. Spiritual practice is here an unbending commitment to reality. A pragmatic individual is someone who is utterly responding to reality, which is also the true meaning of being grounded. This involves moving and being in the physical world with the firm intent to uncover the mystery of life and death, incessantly pursuing a quest for meaning and truth. Authentic pragmatism is not about dealing with ambitions, career, money or other provisional aspects of life. It is about systematically seeking, asking and knocking so as to unfold the true meaning of our life and the ultimate mystery, who I call God. This God is the core of all reality, including the reality of our identity. Through spiritual practice we ground ourselves into reality and get rid of all illusions. Complying with the expectations of others and what they consider to be real has nothing to do with being grounded in reality. With spiritual practice I actively embrace the mystery of reality and choose to firmly anchor myself in its power. It is the supreme way of liberation or, as Osho puts it, “the first and last freedom”. Spiritual practice has the power to dispel all fears. Love casts away all fears. And it is this love, who is God, which spiritual practice is meant to unveil in the depth of our being. Spiritual practice is a true commitment to the essence of reality and authentic dedication to what is ultimately meaningful in life. It is what allows direct experience, cultivation and visible emergence of Spirit in this world. Through spiritual practice I release all my rigid and biased ideas, including those related with spirituality and God. I enter into the inner desert, the Cloud of Unknowing, where my heart is cleansed and recovers its genuine sense of amazement. Access to the mystery requires a childlike awe, a wonder rooted in the experience of ecstatic beauty, which is what ancient initiates sought to ground through spiritual and philosophical investigations. Embracing the unbiased nature of a child emerges as the absolute requirement for penetrating the mystery of spirituality. “Let the little children come to me, and do not hinder them, for the kingdom of God belongs to such as these. I tell you the truth, anyone who will not receive the kingdom of God like a little child will never enter it.” (Luke 18:16-17). The sense of wonder is an inherent part of childhood. Children are constantly amazed by what adults take for granted. They live as pioneers in a newly inhabited world, where everything, no matter how big or small, becomes a source of revelation and awe. And this innocent attitude is also the basic feature of Aries, the first emerging child of the zodiac. As we start this new cycle of the year, we have the opportunity to return as children and retrieve our instinctive urge to unfold the mystery of existence. The embracement of simplicity and a childlike enquiring nature require great courage in a world focused on productivity, acquisition, ambition and rigid assumptions. Yet, Aries is the first step of a brand new voyage and, when the old journey is over, regularly returns to herald a novel opportunity. Aries teaches us that we can keep the innocent integrity of our heart as a way of genuinely moving on through all the challenges of life. 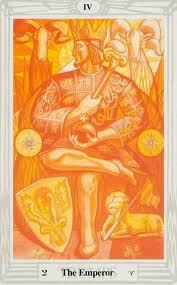 And once Aries opens his childlike heart and acknowledges the God within, his authority is bound to reign supreme. The Emperor firmly dwells in his lucent throne, holding the sceptre of his one-pointed sacred Intent and celebrating both the start and the end of the Game.